This coalition government DO have a minimum room size and minimum room width and a detailed specification of what constitutes a bedroom and below is a game changer in the bedroom tax and especially in appealing this ill-conceived policy. In the bedroom tax everything hinges on the term ‘bedroom’ as Housing Benefit is only reduced (the ‘bedroom tax’) if you have a spare bedroom. Nothing is deducted for a spare toilet or any other spare room, it is only on a spare bedroom, however defined. Until now it has been believed there is no definition of the term bedroom and the DWP infamously issued the U6 HB circular in September 2013 to say a bedroom is merely a room that can accommodate a single bed. And with access space in between the above so the bed can be made and the wardrobe can be accessed and also further activity space for which they give the example of room to get dried after a bath or shower and room in which to get dressed. This is a game changer for the bedroom tax appeals. The government cannot hide behind IDS’s nonsense and for me legal fiction that a bedroom is merely a room that can fit in a single bed and nothing more. 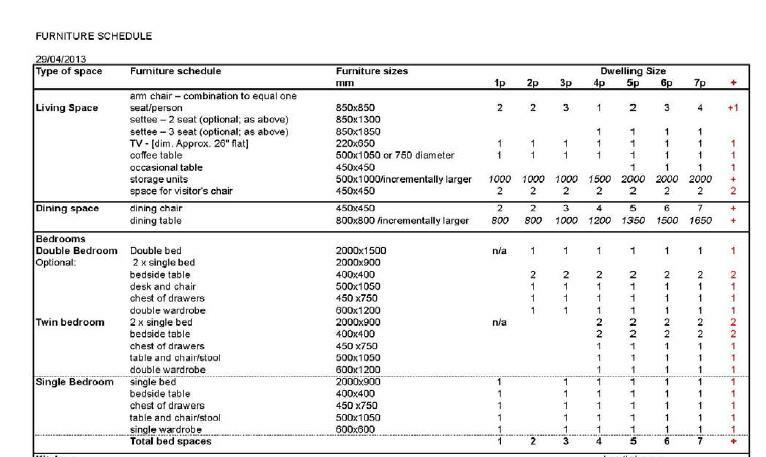 I am urging every bedroom tax affected household to ask their local council to review all of the 481,000 decisions in which a room is deemed to be a bedroom when it is less than this 75.35 square feet and / or is not of a size to accommodate all of the above items of normal bedroom furniture. 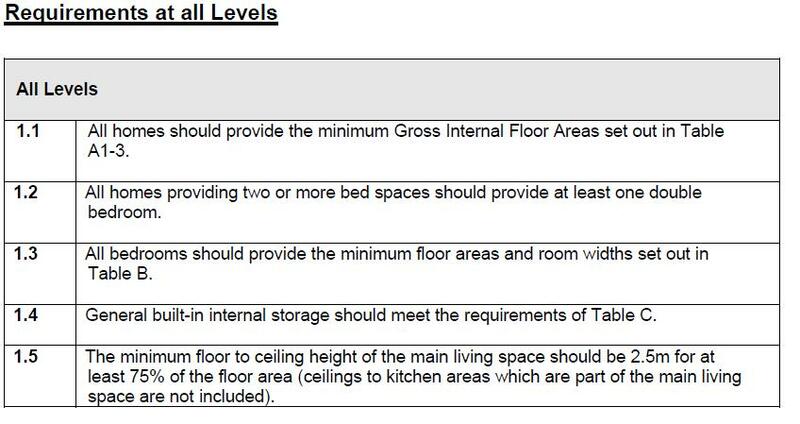 If your council does not revise its decision then I am urging all to formally appeal to a Tribunal on the ground that the disputed room is not a bedroom as it fails to meet the government’s own definition of a bedroom. What does the Government’s definition say? 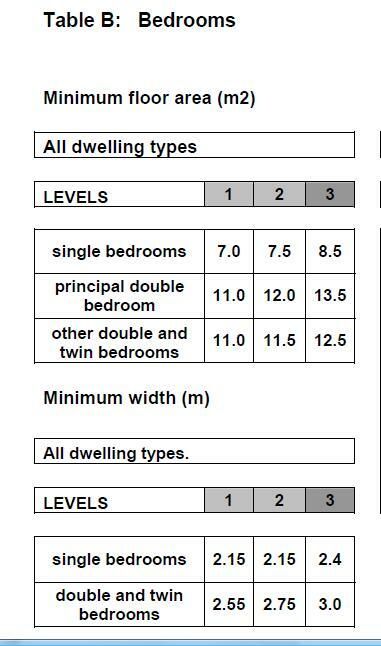 Note well point 1.3 above which says that ALL bedrooms should provide a minimum area and minimum width. The minimum size in floor space of a SINGLE bedroom is 7.0 square metres or 75.35 square feet and the room must have a minimum width of 2.15 metres or 7 feet 1 inch. A DOUBLE bedroom (or twin) needs to be 11 square metres or 118.41 square feet with a minimum width of 2.55 metres or 8 feet 5 inches. Everything hinges upon the definition of a bedroom in the bedroom tax and one of my earliest arguments back in January 2012 was how can you tax something you refuse to define? Yet we have a government definition of what constitutes a bedroom and a definition which is the government’s position on what is a bedroom has been since at least at least August 2013 when they released it. 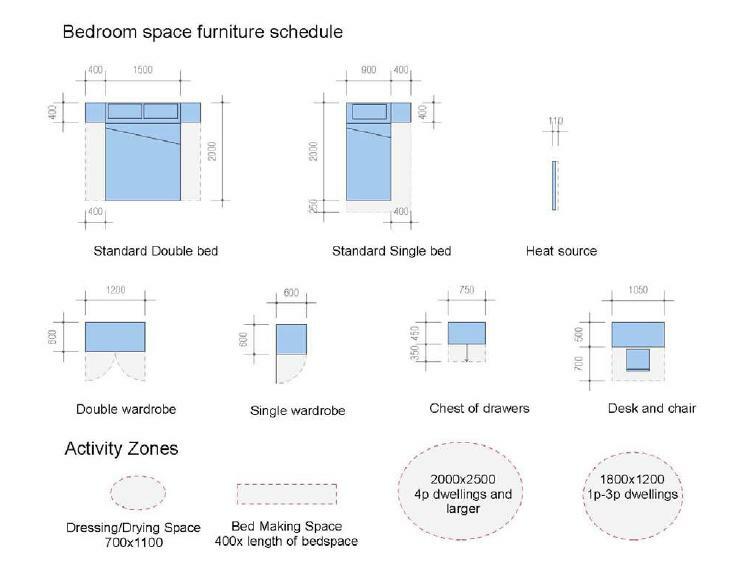 The DWP said in the bizarre U6 HB Circular of September 2013 that a bedroom is a room that can fit a single bed in it, just that and nothing more. That has always been a nonsense and legal fiction yet some tribunal judges have ruled that way citing the absence of a definition of bedroom and going along with the knee jerk view the DWP expressed in the U6 of September 2013. The DWP has also argued in seeking permission from the Upper Tribunal to appeal decisions it has lost that any room which is capable of being a bedroom is a bedroom and citing this U6 circular. Yet the above is the coalition’s own definition of what a room needs to be to be capable of being deemed a (single) bedroom which it says is so much more than a room that can fit a single bed in it! Where is this government definition to be found? It is the “Housing Standards Review” from the Department of Communities and Local Government or CLG which is the government department that looks after housing. In August 2013 they issued a consultation paper and with that part 2 was called “Illustrative Technical Standards” which contains all the drawings used here. The Housing Standards Review is an attempt to set a national standard of minimum housing size and quite cynically some say it reduces the overall size of new properties. However, that is another issue for another day notwithstanding that we have the smallest house sizes in Europe. The real issue is that we do have a coalition government definition of bedroom and that is hugely significant. The DWP cannot argue that the term bedroom’ is merely a room in which merely a single bed fits and nothing else. They cannot state this is the government position because another government department and the one which is responsible for housing in CLG says a very different thing. Some of the naysayers we chirp up that this is not a definition in legislation or regulations. They are right it is not; yet the purpose of the Tribunal is to find fact in the absence of a definition in regulation or legislation and Tribunal judges rightly adopt a position of what would a reasonable fair minded person say is a bedroom – the legal doctrine of the man on the Clapham omnibus. Would the man on the Clapham omnibus, or a fair minded member of the public if you will, say a single bedroom for everyday use is a room with a bed a chest of drawers, a wardrobe and space to make the bed and to get dressed reasonable? Yes he would. This, in short, and there are many other arguments, is why this is a game changer. It matters little that this definition is found in a document that aims to reduce overall property sizes or does it matter that it is not a definition found in legislation or regulations; we have a government definition and a highly detailed definition of the central question in the bedroom tax policy of what is a bedroom. It is not an unreasonable definition and accords with what a reasonable person would say a bedroom is and constitutes and it comes from the same government that IDS is a part of. It cannot hold that any Tribunal can accord with the narrow IDS view of a bedroom being a room with just a single bed in it and not can any local authority administering the scheme too. Of course LAs will not change as it costs them too much to make a proper and legally reliable bedroom tax decision and it will only be the Tribunals which do give a legally reliable decision so the bedroom tax affected household will have to go to Tribunal to get one. That will cost central government a fortune and if it does then that is its own and the First Tier Tribunals with their remit and purpose of fact finding are going to be very busy.